Spencer Fabrications has the expertise and experience required to custom fabricate a variety of products and structures that meet unique requirements and specifications. Over the years, we've fabricated a number of custom structures for outdoor sports facilities, and parks and recreation areas with both standing seam and fabric canopies. 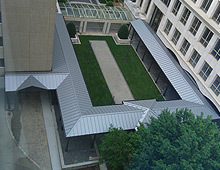 In this instance, Spencer Fabrications performed the custom fabrication of this aluminum walkway canopy that would provide coverage on an existing commercial space in Atlanta, Georgia. 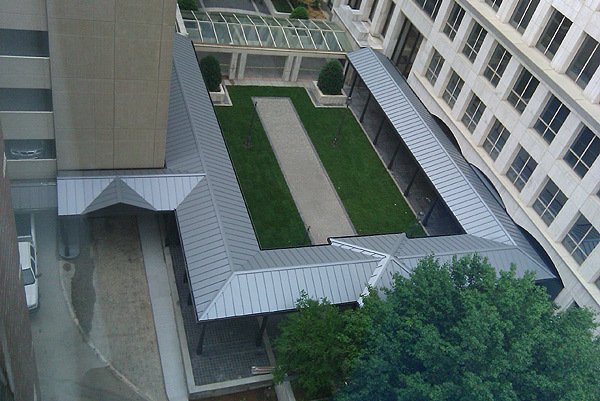 Carefully constructed in aluminum, the massive walkway canopy featured a standing seam roof with integrated gutter beams and lighting chases. We handled every part of the fabrication process, from the cutting and drilling to the welding and fitting, to ensure superior quality throughout the finished product. For more information on the custom fabrication of this aluminum walkway project, please see the table below and feel free to contact us directly to learn about our superior custom fabrication capabilities. Overall Dimensions Length: 262' 9"